Hi there! It has been a long time posting, but mommy has been studying real hard these days and she hasn't let me blog until today. I've been oh-s0-lonely since she's been away studying, serioussssly lonely. All I do is sleep while she's gone. What a lonely dog world. On a higher note, I had to post about this amazing toy that keeps me entertained for a looong time. It's the Wubba toy! It is the Best Toy Ever!!! 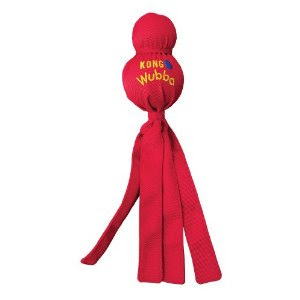 I got the Wubba toy (made by Kong) recently and I absolutely wrroooooove it. Best gift ever! Ok, I say that about all the toys I get, but this one is different. I squeaked the life out of the squeaker, yet the toy is still in tact. Most of my squeaky toys get destroyed in minutes. Mom is so impressed that I haven't chewed anything off yet. 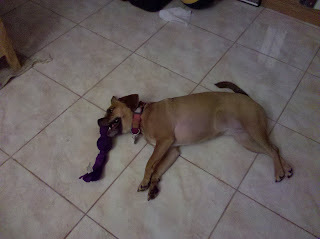 As you can see from the picture, I even fall asleep playing with it. hehe. I definitely recommend you get a wubba too. You'll have loads of fun. Alright, dog buddies, it's time to take a dog nap. Wow, I'm finally 1 year old! I can't believe it. This day has finally come. To celebrate this joyous occasion, Mom got me this birthday cupcake from Harrod's. It was divine!! Mom also got me this silly yellow dress with flowers on it. She said that it makes me look more like a girl and now people won't confuse me for a boy, like they usually do. Well, all that cupcake made me tired. zzzZZZzzz... woof woof. Yay!!!! Mom is back from her "Euro trip." She was gone for 20 days! Don't worry though, I was in good hands while mom was away. My aunt (I'm covering her face in the pic) took care of me. Auntie'O told mommy that I was good for the most part, except that I shed a lot and peed on her in the car (woopsie. It was an accident. I drank a lot of water that day and had to go badly.). I went to the airport to pick her up. I heard her voice and I went bonkers. I gave her lots of kisses and got plenty in return. Mom was real tired, so she slept for most of the day and the whole night. I woke up and mom took me for a long walk. It was great. I took a nap with Auntie 'O. Then the day got even better. Mom and auntie'o took me to a new doggy park. It was great. Can you see my face in the pic? I was the happiest dog in the world. That's a baby boxer and her brother. They kept picking on me because I was smaller than them. I got so scared that mom picked me up and comforted me until I was ok to go play with the dogs. That lab wants his stick back. hehe. He gave up after a few tries. I can be quite reluctant when it comes to sharing. It took mom a while to get me to drop the stick when we had to go home. It was a great day. When I got home, I slept and slept and slept. My first bowl. I chewed up the rubber that keeps the bowls in place. I was teething! Ahhhh. Sleep. Mom loves it when I sleep. She looked at this picture and said she misses my cute belly. It wasn't always easy for mom to train me. Actually, I'm still learning. She's learning too. She never had a dog before and I'm not the easiest dog to take care of. I didn't like to be on my own and created BIG messes when mom was away at work or in the other room. I destroyed a lot of things and still do. Owning a dog takes a lot of patience. Oh, and costs a lot too. What can I say? - I'm high maintenance.